Telmex has been pretty reliable for me at 10 Mbps down, and I've been surprised to see how little HMA VPN knocked it down. But then I'm only about 3 blocks from their central office in P�tzcuaro. The following may be a little off the VPN subject, but since speed matters for content viewing, you may find it useful. I have Telmex ADSL with Paquete Acerques (5 Mbps) for $599/month. 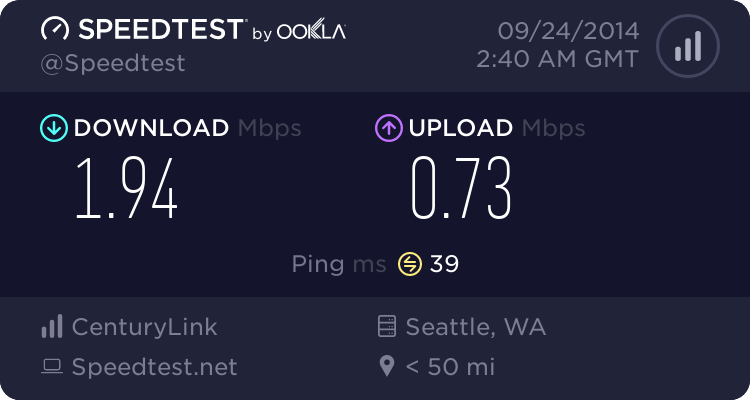 I paid an extra $199/month for an additional 5 Mbps, except that beginning in March the 5 Mbps additional appears on my bill as $0 with a note saying it's a promoci�n. So I'm paying $599 for 10 Mbps. I didn't know what that was about until I noticed two things this evening. First, if you go to their Paquete website and look at the various packet offerings, all mention of speed differences between the three paquetes (3, 5, 10 Mbps) is gone. Vanished without a trace, as has the info on purchasing additional bandwidth. All three packets now say Incluye la conexi�n m�s r�pida en infinitum. Hmm, maybe that's why they stopped charging me for the 5 Mbps additional, despite continuing to deliver it. Second, about 3 months ago Telmex came through our little colonia and strung fiber optic cable on the poles, readily identified with yellow posters saying something like this to discourage thieves: "Cable Fibra �ptica. No tiene cobre." If you go to this website, you'll see that the three paquetes are now being offered with fiber optic service AT NO ADDITIONAL COST. Reading through the FAQs, the "no additional cost" includes a new fiber optic modem in your house, and running the fiber through your cable ducts. Telmex caveat: only where service is available (i.e., where there's a fiber trunk nearby).